Any kid that grew up going to Indian restaurants knows that "butter chicken" is a staple of childhood. 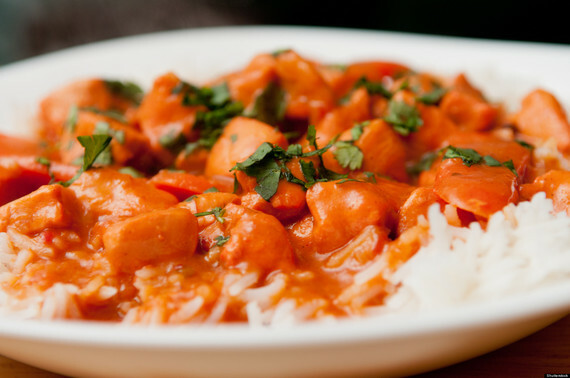 I remember every time we went out for Indian food the number one thing we'd order was butter chicken, rice, and naan. The chicken would be tender and drenched in a velvety sweet but savory tomato-ey sauce. It was luscious and luxurious and we'd always look forward to it since our Mom was vegetarian and didn't cook meat at home. Fast forward 20 years and I myself became vegetarian. So when someone recently asked me if I had a recipe for Butter Chicken I was all like "whaaaaa?" What kind of Indian am I that doesn't know how to make Butter Chicken??!! So what does a smart, resourceful mom (like all of YOU!) do? She asks around. We find that motherhood is so much about getting advice and suggestions from other moms. It's a brethren of people that are always willing to help one another. So I tapped my crew and my good friend, also a Millennial First Generation Indian American mom had a recipe that was passed on to her from her own Mom. So here it is! 1. Melt butter in a pot on medium heat. Add cumin, cardamom, and cloves and wait until they sizzle. Add ginger, garlic, and onion and cook until onions are softened and light brown, about five minutes. 2. Add turmeric, salt, pepper, garam masala and ground coriander. Cook onions with spices on high heat for 3 minutes. Take pan off heat and add can of tomatoes. Add handful of cilantro and milk. 3. Return pan to medium heat and cook for 20 minutes stirring occasionally, covered. Mash tomatoes until tomatoes are fully incorporated into sauce during the 20 minutes. At the end of 20 minutes, there should be some pools of butter floating on top of the sauce. 4. Add chicken and cook on medium heat, covered until chicken is cooked through, about 10 minutes. 5. Serve with Paratha or Basmati Rice. Optional - you can add diced potatoes, ¾ cup of organic peas, and chopped spinach before you add the chicken to add some more vegetables to the dish if you want as well.